Antoni has been a crypto-enthusiast since 2011. As a Member of Parliament, he has ferociously advocated and passed legislation for blockchain solutions on a variety of e-government services, most notably e-voting. He has been involved in several FinTech companies since 2013, being a Chief Innovations Officer at Credissimo, a leading European FinTech Group specialising in Online Consumer Lending. 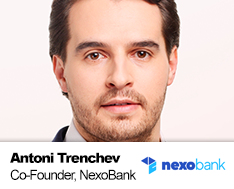 Antoni is a Co-Founder of NexoBank, a company that strives to unlock the value of digital assets.